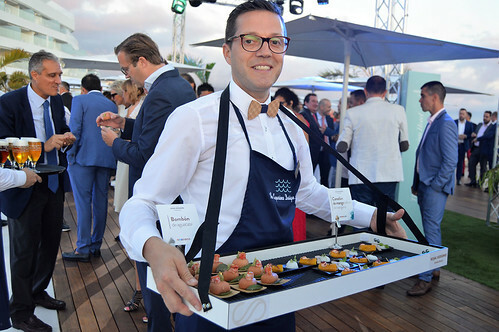 I got to La Caleta in good time for the opening party at Barcello Hotels new baby Royal Hideaway Corales Resort in Tenerife, so why did I hesitate to go in? 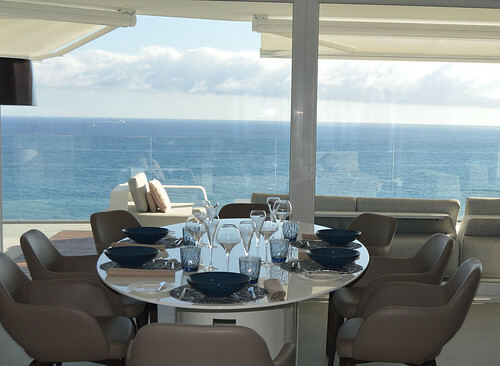 Maybe because it makes such a stunning impression on the Adeje coast, I felt the need to skirt around the outside to appreciate the design of Tenerife architect Leonardo Omar. The spiral starwells, and bold white layers are very impressive. 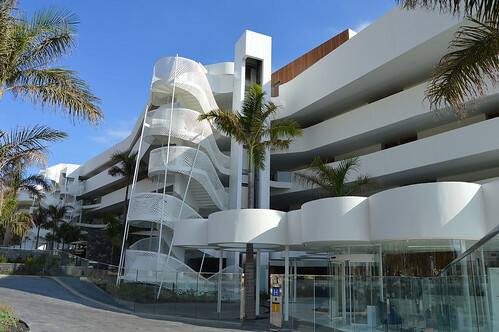 Before the January opening it had already won an award as Best European hotel in construction from Hotel Management magazine. Two five star hotels embrace each other, one the family friendly Corales Beach, and the other the adults only Corales Suites. 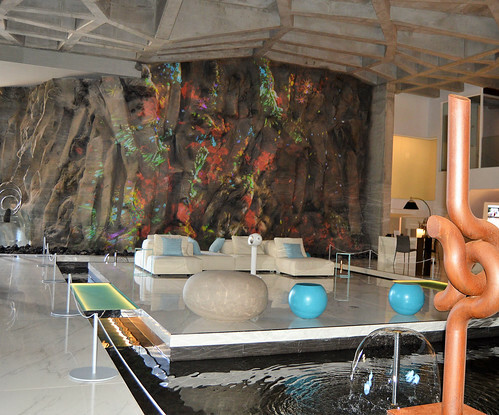 As I entered the Corales Suites reception area, with a big cavern, bubbling fountains, and a multi coloured rock face wall.,James Bond and Thunderball came to mind. Welcoming speeches were made in the Alice cafe, that specialises in an exotic range of teas and coffes. Simon Pedro Barcelo, Co President of the Barcelo Group spoke proudly of the resort and predicted a bright future for tourism in Tenerife. The resort employs 250 staff, another big boost for the island economy. The walkway led to a shopping arcade but I was destined to a quick lift up to the fifth floor of the luxury suites. 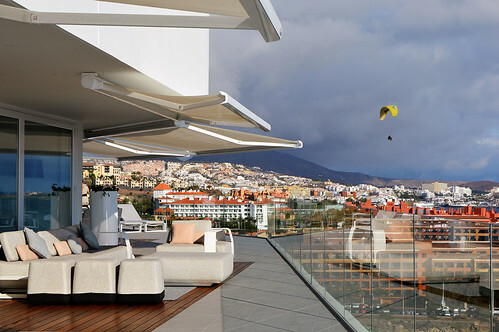 La Caleta is a smashing old fishing village bordering on the five star hotel boom, it can´t help looking good, but on this night a procession of hang gliders landing on the beach added a classy touch to the view from the terrace with its own spa pool. As singers welcomed party guests from a rocky perch below, the suite had my full attention. There are 160 of the suites and they all redifine the word luxury. A chef and his assistants stood ready to receive behind the in suite kitchen counter, just one of the mega extras you can book. After relaxing on the comfy bed, purely for research, I had a peak at the pillow menu, feather, thermal memory foam, or petit plus, the choice is yours. 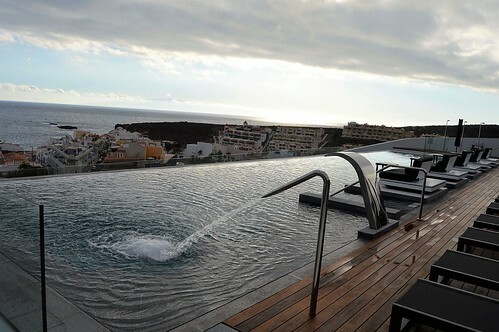 Lets talk pools, up to the fifth floor I glided up in the lift to see the infinity pool, it was worth the ride, great views over to El Puertito were the backdrop to the roof top restarant El Maresia, run by the Hermanos Padron who have the Michelin Star El Rincon de Juan Carlos, in Los Gigantes. Back down to the piano pool, where music was wafting through the air. 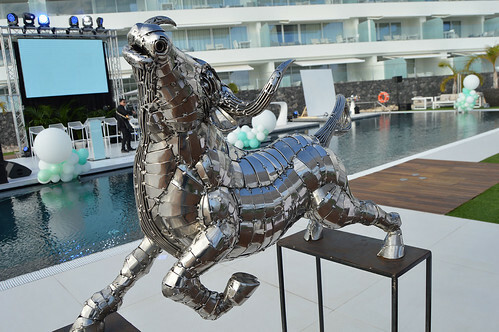 I had already noticed some metalic sculptures by local artist Yaron Lambez of La Musa in Adeje, there were many more surrounding the pool side to be admired as samples of culinary creations were served. 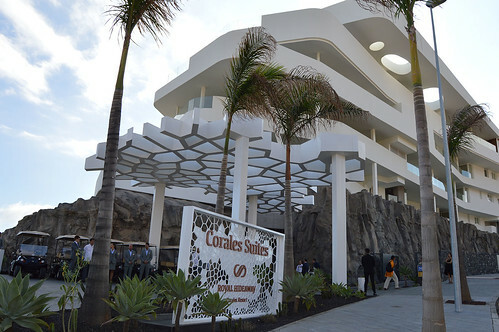 Local politicians including the presidents of Tenerife, and the Canary Islands formerly welcomed the new addition to Tenerife´s holiday attractions. and Pilar Rumeu of TV Canaria hosted the presentations. It was good to see the resort acknowledge all the services and workers who are the life blood of the resort. An earlier buggy ride gave me a guided tour around the grounds and perimeter of the huge building. 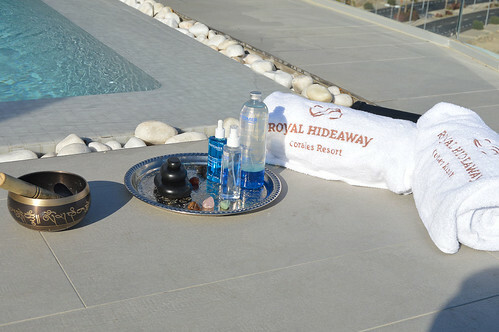 One of the most impressive things about the resort was the passion, knowledge, and friendly attitude of all the staff. 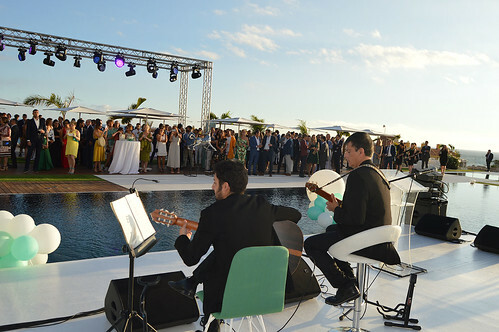 Back at the pool the water shimmered as the guests all mingled, the Cava, wine, and Dorada flowed, and the sun set to a gorgeous fanfare of colour.